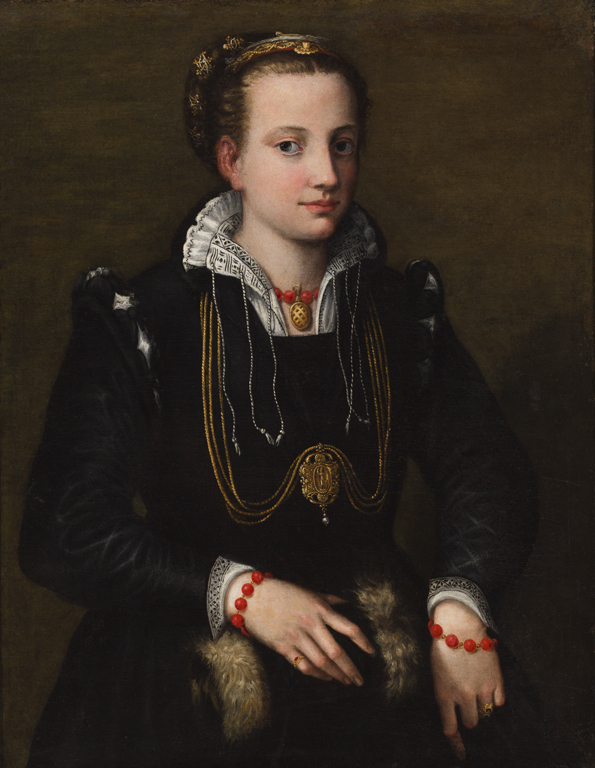 Once considered a self-portrait, this painting is now identified as a portrayal of Sofonisba Anguissola's younger sister, Minerva. A clue to her identity is the inclusion of the helmeted goddess Minerva on her medallion. This portrait illustrates the elegant Mannerist style popular at the courts of Europe in the late sixteenth century: note Minerva’s hands, their graceful pose and elongated fingers, as well as the lush fabrics and elaborate ornaments. Anguissola was the first woman artist of the Renaissance to establish a major reputation as a painter. In 1559, she was invited to serve as court painter to King Philip II of Spain, for whom she worked for more than a decade. Adams, Laurie. Italian Renaissance Art. Boulder, Colo: Westview Press, 2014, fig. 17.17, color illus. p. 378. Eastberg, John C. and Eric Vogel. Layton’s Legacy: A Historic American Art Collection 1888–2013. Milwaukee, Wisconsin: Layton Art Collection, Inc., 2013, pp. 231, 302–305, 460, color pl. 25, p. 304, color illus. p. 231, color detail pp. 302 and 305. Sawinski, Catherine. Mythology at the Milwaukee Art Museum--Part 1. Milwaukee Art Museum: Under the Wings, August 17, 2012. http://blog.mam.org/2012/08/17/mythology-at-the-milwaukee-art-museum-part-1/. Adams, Laurie. A History of Western Art. New York: McGraw-Hill, 2010, p.309, color pl. 17.4. Adams, Laurie Schneider. Art Across Time. Vol. 2. 4th ed. New York: McGraw-Hill, 2008, p. 572, color pl. 15.8. Barko, Cortney Cronberg. Rediscovering Female Voice and Authority: The Revival of Female Artists in Wendy Wasserstein's The Heidi Chronicles. Frontiers: A Journal of Women's Studies. Vol. 29, no. 2 2008, p. 123, pl. 1. Andera, Margaret, Nonie Gadsden, Britt Salvesen, and Laurie Winters. Collection Guide: Milwaukee Art Museum. Milwaukee, Wisconsin: Milwaukee Art Museum, 2004, pp. 13 and 67, cat. 10, color illus. p. 13. Adams, Laurie Schneider. Art Across Time. Vol. 2. 2nd ed. New York: McGraw-Hill Higher Education, 2002, color illus. p. 616. Milwaukee Art Museum. Building a Masterpiece: Milwaukee Art Museum. New York: Hudson Hill Press, 2001, p. 63, color illus. Stathis, Roberta. Explore World History. 2nd ed. Ballard & Tighe Publishers, 2001. color illus. Adams, Laurie Schneider. Art Across Time. Vol. 2. 1st ed. McGraw-Hill College, 1999, p. 593, color pl. 16.9. Mittler, Gene. Understanding Art. Vol 2. Glencoe/McGraw-Hill, 1998, color illus. Martin, Elizabeth and Vivian Meyer. Female Gazes: Seventy-Five Women Artists. Toronto: Second Story Press, 1997. Janson, Anthony and H.W. Janson. History of Art. 5th ed. New York: Harry N. Abrams, Inc. Publishers, 1997, color pl. 683. Buckler, McKay Hill. A History of Western Society. 5th ed. Boston: Houghton Mifflin Company, 1995, b/w illus. p. 420. Ferino-Pagden, Sylvia. Sofonisba Anguissola: Die Malerin der Renaissance (um 1535–1625). 1995, Vienna: Kunsthistorsches Museum, Wien, 1995, p. 101, cat. 29, color illus. p. 102. Kusche, Maria, and Sylvia Ferino-Pagden. Sofonisba Anguissola: A Renaissance Woman. Washington, DC: National Museum of Women in the Arts, 1995, color pl. 13. Buffa, Paolo (ed.). Sofonisba Anguissola e le sue sorelle. Milan: Leonardo Arte, 1994, p.228, cat. 22, color illus. p. 229. Ghirardi, Angela. Una Ricerca Iconografica Nel Cenacolo Delle Anguissola: I Ritratti Di Minerva. Paragone. No 509, 1992, pp. 35–43, b/w illus. pl. 15. Newsday, New York, January 30, 1989, color illus. Heller, Nancy. Women Artists: An Illustrated History. New York: Abbeville Press Publishers, 1987, color illus. p. 17, pl. plate 6. Goldstein, Rosalie, ed. Guide to the Permanent Collection. Milwaukee, Wisconsin: Milwaukee Art Museum, 1986, p. 28, color illus. p. 28. Milwaukee Journal, August 10, 1952, b/w illus. Sofonisba Anguissola e le sue sorelle / La prima donna pittrice, Sofonisba Anguissola die Malerin der Renaissance (um 1535–1625) / Sofonisba Anguissola: A Renaissance Woman, Centro Culturale città di Cremona, Cremona, Italy, September 17–December 11, 1994; Kunsthistorisches Museum, Vienna, Austria, January 17–March 26,1995; National Museum of Women in the Arts, Washington, D.C., April 7–June 15, 1995. Layton School of Art, Milwaukee, Wisconsin, November 10, 1961–April 10, 1969.